After debuting her new blonde do’ at the 2017, AMAs, Selena Gomez jetted home to her native, Texas for Thanksgiving! Is Justin Bieber heading to the Lone Star state to make mends with her family? Selena Gomez, 25, recently flew home to Texas, where she grew up, to spend Thanksgiving with her friends and family. She was filmed by a friend, slurping spaghetti on Nov. 21, in an Instagram video [watch below]. So, is Justin Bieber, 23, not far behind? — Well, while it’s unknown where the Biebs will spend turkey day, it may be a good idea for him to jet off to Texas. As you may know, Selena’s family aren’t exactly his biggest fans after watching Jelena’s past relationship woes. 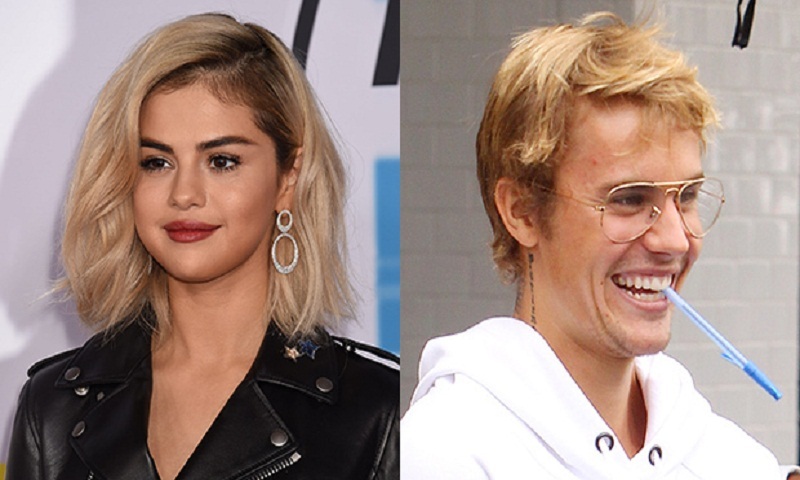 Sel ended up broken hearted after they split in late 2015, when Justin had a bit of a reckless period in his life. Therefore, Selena isn’t the only one Justin needs to completely win over; although he’s pretty much marked Sel off his list. Jelena let us know that they were full on, back on, when they sealed it with a kiss in new photos on Nov. 15. Selena showed up to an LA ice rink, where Justin was playing a pickup game with friends on, and the pair shared a sweet kiss together. It was almost as if the photo was out of a movie — Sel, in an oversized hoodie, leaned over the side of the rink with her puppy in hand, to kiss Justin who was suited up in his hockey gear; It was kind of like the notebook, minus the rain… and Justin wasn’t holding her in the air; But, you get the picture. Jelena shocked the world, and nearly broke the internet, when they reunited at her CA home in late October. They spent hours on end inside her home with mutual friends and were photographed separately entering her home. Selena was still dating The Weeknd, 27, at the time of her reunion with the Biebs, however, that was short-lived. She and The Weeknd split just days after the Justin was spotted at her home. Justin and Selena became inseparable after that initial, first hangout. They’ve been spotted on sweet strolls through CA, riding bikes, out to romantic meals and attending church services together. Interesting enough, we may have seen them together more times in the past few weeks than in their entire relationship… and that began in 2009. So, you can infer that they’ve been hanging out A LOT lately. Sel did, however, show up to the 2017 AMAs solo, and with a new look! She debuted her new blonde do’, in a skintight, black leather mini dress. Sel took the AMAs stage to perform her hit “Wolves”; which was her first performance since she underwent a lifesaving kidney transplant. And, it’s been reported that Justin has been extremely supportive since he learned of her lupus diagnosis. We’re totally here for this rekindled romance!